(www.esrl.noaa.gov/gmd/ccgg/trends/) and Ralph Keeling, Scripps Institution of Oceanography (scrippsco2.ucsd.edu/). increasing CO2 greenhouse effect will affect the temperature of the planet; the key question is by how much. greenhouse gases trap heat in the atmosphere and reduce infrared radiation to space. The imbalance causes the Earth to absorb more energy than it radiates. data from 1993 to 2009). All this evidence demonstrates the recent acceleration of global warming. But what about the evidence from global surface temperatures? measurements are easily appreciated by the public, relating to their sense of what warming means. 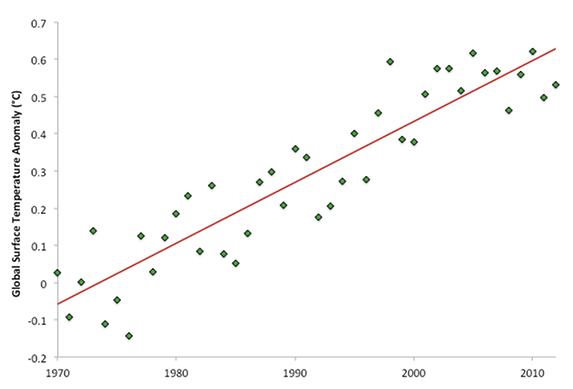 Two perspectives on the global average temperature changes since 1970. In the upper panel, the data are fit with a straight line. In the lower panel, they are fit with several straight-line segments, giving a “stair-step” fit. Both show the same temperature increase of 0.7 C over forty-two years, but we react differently depending on the way the data are presented. 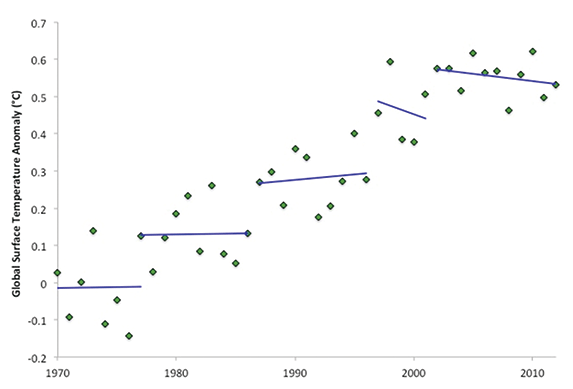 The plots show annual temperatures, relative to the average from 1964–1994. Data are averages from NASA (Goddard Institute for Space Studies), NOAA (National Climatic Data Center), and the UK Met Office (Hadley Centre). Figure compliments of Dana Nuccitelli (skepticalscience.com). climatologically significant temperature. However, we are impatient and unwilling to wait twenty to thirty years to assess the reality of climate change. Looking at just the past decade of surface temperature measurements, there is an apparent plateau. straight lines. The multiple straight-line fits show a temperature plateau from 2001 to 2012.
past half-century have been higher than in the previous decade, and the two warmest years were both in the past decade, in 2005 and 2010.
not it yet shows up in short-term surface temperature data. humans do can have a major effect on our planet. This narrative asserts that climate scientists are simply seeing a correlation between temperatures and CO2 concentration and claiming naively that this correlation implies causation. 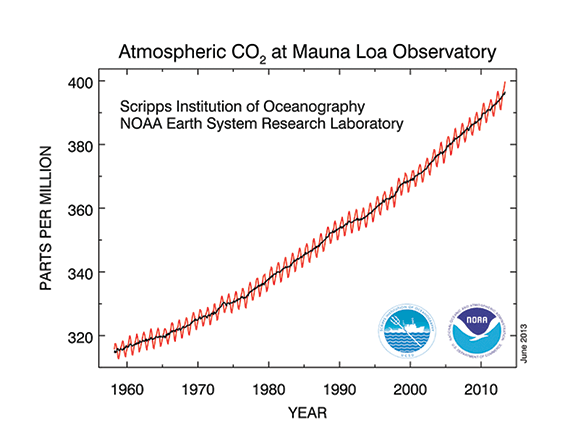 Therefore, if the temperatures do not rise steadily with CO2, this disproves the entire idea of climate change. all evidence according to a Darwinian dogma. John R. Mashey is a computer scientist whose career has extended from Bell Labs to the Silicon Valley. Many of the wide variety of scientists he has worked with have used software or hardware he helped create. For the past few years he has been studying climate science, anti-science, and energy issues.